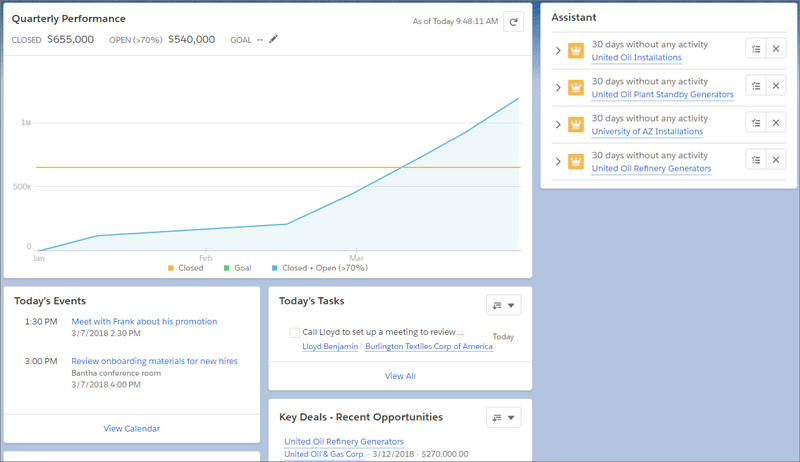 Give your users everything they need to manage their day from the Home page in Lightning Experience. 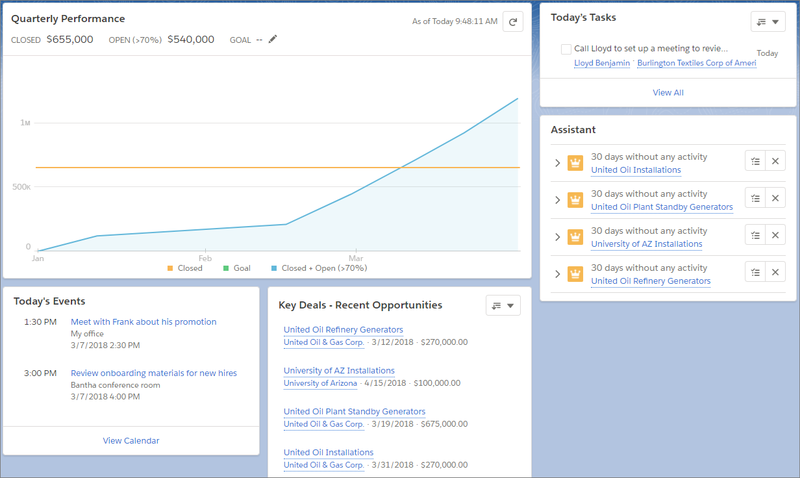 Your sales reps can see their quarterly performance summary and get important updates on critical tasks and opportunities. You can also customize the page for different types of users and assign custom pages for different profiles. You can create a custom Home page in two ways: Create it from scratch using a template, or edit an existing page. To edit an existing page, you can click from the Home page, and then select Edit Page to create a copy of the current page to edit. If a customized page exists and is active, selecting Edit Page opens that page to edit. We’re going to create a Home page from scratch. When you select Edit Page for the first time, Salesforce makes a copy of the standard page. This copy is what you then edit in the Lightning App Builder. 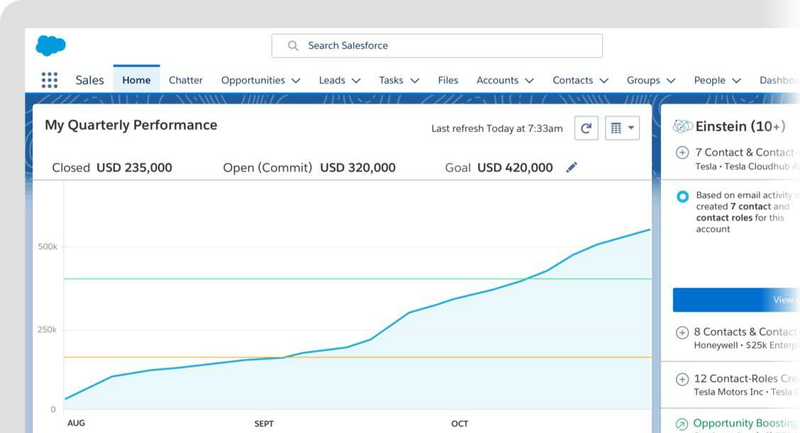 Pages created like this—as copies—retain a reference to the standard page, which means that Salesforce can upgrade the page copies for you with new capabilities in the future. If you create a page from scratch, then you own it completely and new page capabilities Salesforce rolls out won’t appear automatically. We’ll tweak the position of the components on the standard Home page layout slightly to give you an idea of what’s possible. Click New, and select Home Page. Step through the wizard and name the page New Home Page, select the standard home page template, and then click Finish. The components pane contains all the standard components available for the Home page. Drag the Assistant component to the top right region. Drag Performance to the top left region. Add Today’s Events to the lower left region and add Key Deals to the lower right region. Add Today’s Tasks above the Assistant. But wait, what’s this? There’s more? Yes, there is. Saving the page isn’t enough to get it out to your users. Lightning pages must be activated before your users can see them. Normally, if you aren’t done with your page, or aren’t ready to make it public, you can click Not Yet here to save the page and return to the App Builder. But that’s not us. We’re bold! We’re done with our page and want to give it to our users right now! Click Activate, and we’ll do just that. If you saved previously and didn’t activate the page, you can click the Activation button in the toolbar to be ready for the next section. When activating a Home page, you have two options: You can make it the default for everyone, or assign it to one or more profiles, giving your users access to a page designed just for their role. Let’s assign this home page to the System Administrator profile so we can go look at it afterward. Select Assign this Home page to specific profiles, then click Next. Scroll down the list of profiles and select System Administrator. Click Next, review the assignment, and then click Activate. That’s it. Let’s go take a look. Just for reference, here’s an example of the standard default Home page. Think of this as the “before” in this Home page makeover. Now, let’s compare it to what we did. Navigate to the Lightning Experience home page. Bask in the glory of your newfound page customization skills. All right! Let’s move on to record pages.